We got our first clear look at a phone believed to be the LG G6 a few days ago, and now another shot of the phone has leaked out, but this time showing it from the side. The new image, shared by underkg, gives us a slightly different view, revealing what appears to be a SIM card slot on the right edge – and we already know from the previous image that the volume keys seem to be on the left edge. Otherwise, this doesn’t show us much that we haven’t seen before, but it matches the design of the last leak, further suggesting that the two could be accurate. We can see again that there’s a metal frame and almost no bezel around the screen, which is likely to be 5.7 inches, 1440 x 2880 and have an unusual 18:9 aspect ratio. 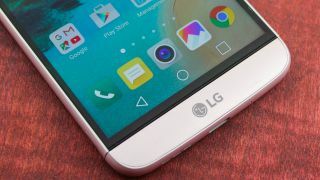 Based on previous rumors, the LG G6 might also have a dual-lens camera, a waterproof build and fast wireless charging, but will likely drop the modular design of the LG G5 and may just use the Snapdragon 821 chipset, rather than the newer Snapdragon 835. If you like the sound of LG’s upcoming flagship you should be able to buy it soon, as the company is likely announcing it on February 26.